Written by Admissions creator John Viscount, Mind What Matters. 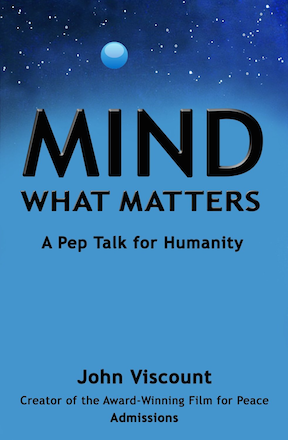 A Pep Talk for Humanity is an inspiring collection of stories and writings that eloquently illustrate how to remain in the peaceful sanctuary of our higher mind no matter what the world serves up. This rich treasure of healing philosophy identifies life-changing shifts in thought that have helped people from all walks of life transcend the perennial obstacles to achieving happiness. Viscount’s entertaining writing style expresses a powerful new voice on the literary stage and serves as a profound and uplifting guide to personal transformation. Download free eBook preview with excerpts.